Caribbean citizenship dreams in jeopardy? DUBAI: The fate of hundreds of GCC residents seeking passports of Caribbean nations hangs in the balance amid allegations of fraud in the various economic citizenship schemes run by these countries. Caribbean passports have always been highly sought-after in the Middle East as they offer visa-free travel to over 130 countries. Since the time Caribbean nations slashed citizenship costs to rebuild infrastructure damaged by recent hurricanes, there has been an even bigger surge in applications from the region. High-net-worth families in the GCC contributed to a 76 per cent spike in demand in the last quarter of 2017, according to the findings of an immigration firm in the UAE. Most applications under the Citizenship By Investment Porgrammes (CBI) were for Caribbean nations such as St Kitts-Nevis, Dominica and St Lucia. However, in recent days, these programmes have been plagued by a massive scandal with Caribbean media reports suggesting that many immigration firms — including some in the UAE — circumvented legal requirements or forged government documents to process citizenship applications, depriving government exchequers of valuable foreign currency. In December 2018, the issue rocked St Kitts-Nevis Parliament and even led to a no-confidence motion against prime minister Dr Timothy Harris. A Dubai-based law firm specialising in economic citizenship said the fallout of the racket could jeopardise hundreds of applicants. Sam Bayat, CEO of Bayat Group, said agents were abusing CBI schemes by offering citizenships at way below government-sanctioned rates through real estate trickery. “Some 2,000 applications are received annually for St Kitts-Nevis citizenship, 2,500 for Dominica and around 500 each for Saint Lucia and Grenada. All applications processed under these CBI schemes over the past four years are under the scanner. Those that didn’t follow the process may be cancelled and the applicants could lose their investments or have their citizenships revoked,” said Bayat. But Les Khan, head of the Citizenship by Investment Unit (CIU) of one such country — St Kitts-Nevis — ruled out any such possibility. Talking to Gulf News at a meeting arranged by Consulate General of St Kitts-Nevis, Justin Kareem Hawley, on January 28 both Khan and St Kitts-Nevis’ minister of justice, legal affairs and communications, Vincent Fitzgerald Byron Jr defended the programme, saying the allegations of fraud were “unfounded and politically motivated”. They also allayed concerns of applicants of losing St Kitts-Nevis citizenship. The fear stems from threats by former prime minister Denzil Douglas who has repeatedly said that if he returns to power, he will revoke the citizenship of any applicant who is found to have underpaid for the country’s CBI programme. St Kitts-Nevis goes to polls early next year. Khan said certain parties with personal agendas were trying to malign the programme. “Let me say this, nobody will be stripped of their citizenship. We’ve a robust programme and we follow the due process. Yes, we’ve come across some dubious cases, but they’re very few and far between. We’ve referred them to the police,” said Khan. However, he couldn’t explain how their agents were selling citizenships way below their legitimate price. “You [should] pose that question to the agents,” he said. The allegations are unfounded and politically motivated. We have a robust citizenship programme and we follow the due process. 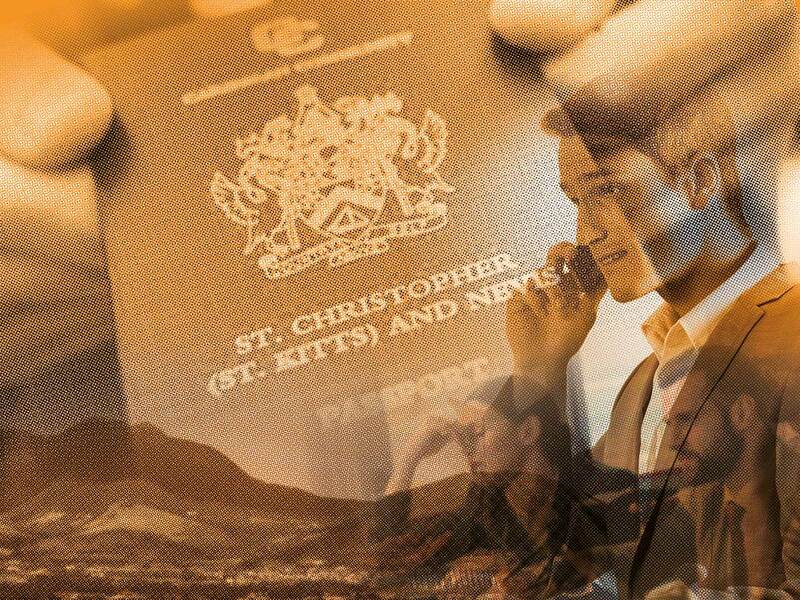 Applicants looking for St Kitts and Nevis citizenship have two choices. The first is a donation to the Hurricane Relief Fund (HRF) which requires a contribution of $150,000 (Dh550,500) for a single applicant with up to three dependents. In the second option, they are required to invest a minimum of $200,000 in an approved project and also pay $75,000 towards real estate fees. Bayat said regardless of the rule, many agents have fraudulently switched applications from the donation option to real estate investment and misappropriated client money into personal accounts. Explaining the modus operandi behind the racket, Bayat said: “A candidate is required to donate $150,000 to the government once his application is approved under the HRF scheme. 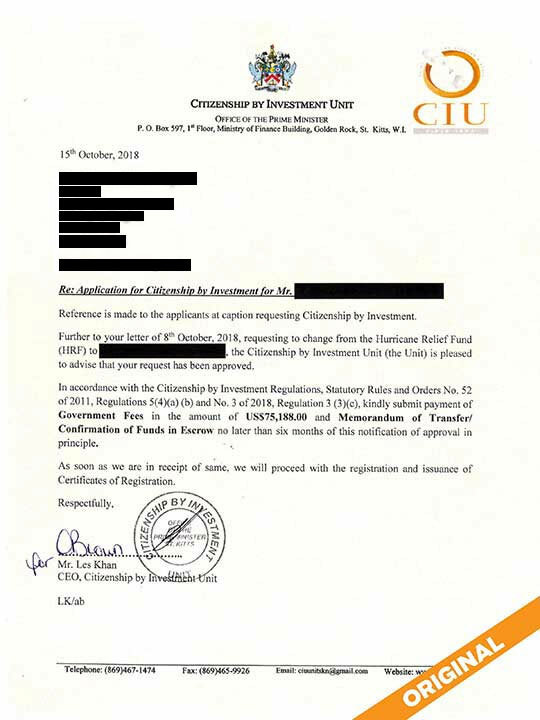 Unknown to him, the agent requests the Citizenship by Investment Unit (CIU) to switch to the real estate option. 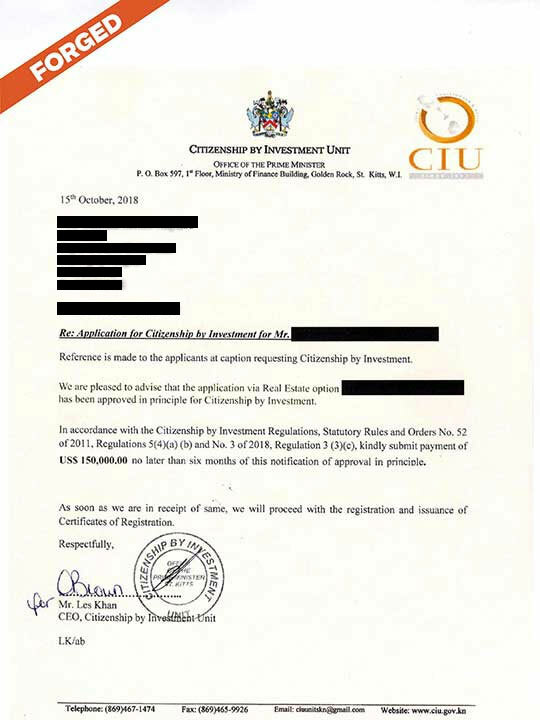 Hoping this would inject the much-needed cash into their realty sector, CIU readily accepts the change and issues a letter demanding the stipulated $75,000 government fee. At this juncture, the agent enters into a secret pact with a developer. As part of the deal, he splits the client’s money ($150,000) with the developer, who is still left with a sizeable amount in kickbacks after having paid $75,000 towards special government real estate fees. The developer doesn’t have to build anything since no one is following up to see if he does. 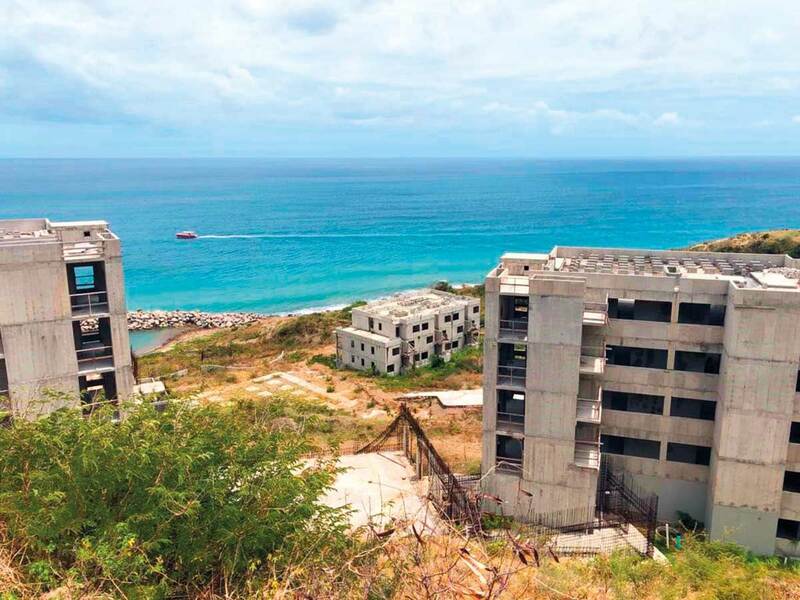 As for the applicant, he doesn’t get anything of tangible value in return for his purported real estate investment except for St Kitts and Nevis Citizenship as would be the case if he had remained with the HRF option. The government gets its fee ($75,000), but it’s half of what it could have got under the HRF scheme. Worse, it never gets to know if the applicant gave $200,000 to the developer as specified under the programme. As a result, hardly any money ends up in real estate projects many of which are stalled because of lack of funds. Khan said this was not true and that they have an Escrow Account Bill in place to safeguard the programme. “The funds are held in escrow accounts in St-Kitts and we ascertain everything before issuing a citizenship certificate,” he said. Local media reports in St Kitts-Nevis say the government has offered no evidence or other assurance that the funds in question are actually held in escrows. According to them, the economic citizenship abuse is estimated to have cost St Kitts-Nevis between $30 million and $130 million. Similar allegations of fraud have been reported by some other Caribbean islands. Bayat said he has come across cases involving forged letters of approval (see box), unmonitored switching and undercutting of the minimum price required for the real estate investment option. “The scale of the scam is mind-boggling,” he said. A Dubai-based immigration firm with British pedigree is at the centre of the Citizenship by Investment (CBI) scandal amid allegations that it forged a St Kitts-Nevis government letter. Gulf News is in possession of a copy of the document and accompanying emails which point to a large-scale racket. The letter would have a client believe that his application via real estate option in a development has been approved in principle for citizenship by investment. It then goes on to seek a payment of $150,000 within six months. As it turns out, CIU never wrote that letter. 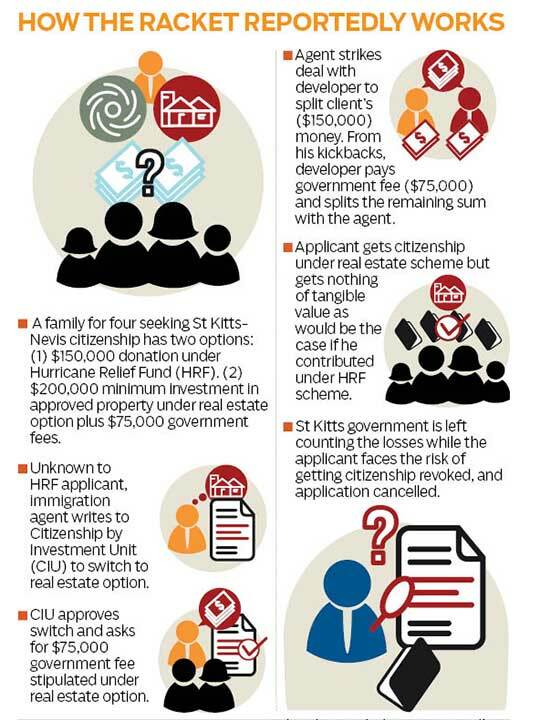 Meanwhile, the St Kitts-Nevis-based citizenship firm to whom it was addressed, has written to Gulf News emphatically stating that "it was not involved in any way" with the altering of the government-issued approval letter. "Upon learning of this apparent act of forgery, we immediately met with the Head of the CIU to apprise him of the development, wrote an official letter to the CIU documenting the matter, and requested that the matter be urgently investigated to ascertain the party or parties involved in the apparent forgery,” the email stated. The scale of the scam is mindboggling. The fallout of the racket could jeopardise hundreds of applicants from the region. Subsequently, the local service provider wrote to CIU urging them to release all files with the overseas agent from their supervision. ‘We have no formal business relationship with the developer in question and are not party to any arrangements or agreements between the developer and the overseas agent. "We denounce the apparent abhorrent and unsavoury acts that are being perpetrated against the St. Kitts and Nevis CIP by a handful of bad actors. We are waiting for the CIU and the government to take decisive and robust action against these less-than-savoury actors,” the email said. Sam Bayat, who is investigating the case, said he has alerted local authorities about the forgery. The Citizenship by Investment (CBI) scheme is an important source of revenue for St Kitts and Nevis, but since hitting its peak in 2015, income from the programme has been on the decline.